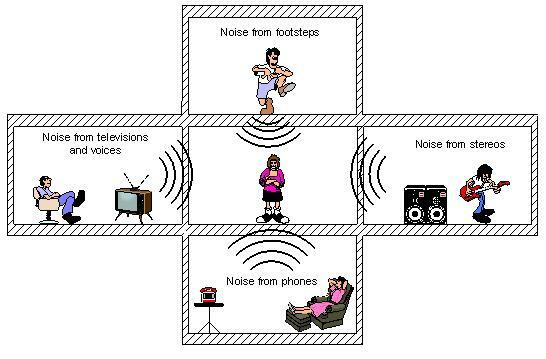 In any multiple unit residence, sounds come into a unit from adjoining walls, ceilings, windows, floors and duct work. The best way to deal with noise control, is in the beginning stages of a project. J R Engineering has worked with architects and contractors, making recommendation based on the design drawing, saving the client time and money. If construction is complete or nearly so, we are equipped to perform a full room acoustic analysis including room reverberation times, wall transmission loss, Field Sound Transmission Class (FSTC) and Impact Insulation/Isolation Class (IIC). All the architectural acoustic tests we perform meet ISO and ASTM standards. Sound sources in a multi-unit residence.